Configuration: 3 cards per box; 10 boxes per case. Only 250 cases produced! Inside Each Box: 3 premium hits per box! Leaf is proud to bring to the Hobby an exciting addition to our industry leading Multi Sport Product Portfolio with 2019 Leaf Ultimate Sports! Look for an exciting mix of legends and superstars across all sports! An autographed set featuring stars of well-known sports movies utilizing amazing artwork! Featuring sports movie stars such as Burt Reynolds, Tatum O’Neal and Charlie Sheen! A 4-player memorabilia set featuring legends and superstars that would be a dream team core! Featuring a fearsome foursome such as Ruth/Mantle/Berra/Munson and Kobe/Kareem/Magic/Shaq! 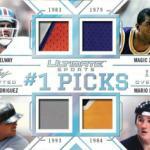 Single player jumbo patch card featuring amazing one of only one crazy patches, logos and tags!! 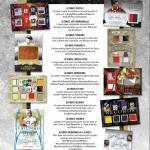 Look for The Exceptional Ones from Thurman Munson, Barry Bonds, Kobe Bryant and Dan Marino! A single player 8 piece memorabilia card featuring anything from jerseys, patches, pants, skates, bats, pads, gloves and more!! 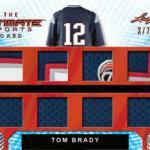 Look for memorabilia cards from legends such as: Tom Brady, Mike Tyson, Pele and Ken Griffey Jr.! 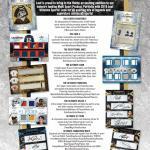 A three player triple memorabilia set featuring patch, jersey and other amazing memorabilia! such as: Mantle/Snider/Mathews, Ali/Tyson/Holmes and Pele/Ronaldinho/Neymar Jr.
A 4-player, 4-patch memorabilia card featuring pillars of sport such as Brady/Montana/Marino/Elway and Bonds/Griffey Jr./Piazza/Jones. A single player autographed memorabilia card featuring sports standouts such as Ichiro, Mike Tyson and Ronaldinho! 4 history-making legends that paved the way for the future of sport such as Ruth/Ali/Howe/Chamberlain and Ashe/O’Ree/Mays/Brown. A jumbo-sized game used bat piece! Featuring baseball legends such as Babe Ruth, Reggie Jackson, Albert Pujols and Johnny Bench! A 4-player memorabilia set featuring those that have made their marks in the record books! such as Ichiro/Selanne/Chamberlain/Sayers and Pele/Nicklaus/Berra/Brady. Signature set featuring Champions from all walks of sport! Such as Floyd Mayweather Jr., Roger Staubach and Stephen Curry. ULTIMATE MEMORABILIA 4, 6 AND 8! Multi-player memorabilia cards featuring HOF Legends, superstars and sports heroes such as Mize/Williams/Snider/Mathews, Munson/Berra/Fisk/Piazza/Bench/Rodriguez and Messi/Ronaldinho/Cris/Pele/Neymar Jr./Kaka/Alberto Torres/Dembele.